With 10,000 acres and 20 miles of project area, the Trinity River Corridor Project showcases a variety of ecosystems along the river corridor. However, Trinity Watershed Management is responsible for all creeks, ponds, streams, lakes, and water bodies in Dallas. Already diverse ecological regions are flourishing such as seasonal wetlands, natural wetlands, miles of green space with emerging Blackland Prairie grasslands, plus Cross Timbers forestland and marsh-like habitat for wildlife and birds. The land features gentle topography and rich clay soils both near the river and away from its banks. Deep in the heart of urbanization, the land thrives because Dallas is focused on everything green! Dallas is setting an amazing challenge for future generations, not just within the limits of our City but around the world, by the mere fact that the City owns one of the largest urban bottomland hardwood forests in America, if not the largest forest all within city limits. A strategic decision was made before the 1998 and 2006 bond programs for Dallas to acquire the forest and become its steward. As this forest matures and is allowed to change with the seasons, Dallas will become the envy of many cities because of this beautiful resource. It will help to shape a new future as plans unfold to nurture the land and forest creating unexpected outdoor venues and gathering places for the public. 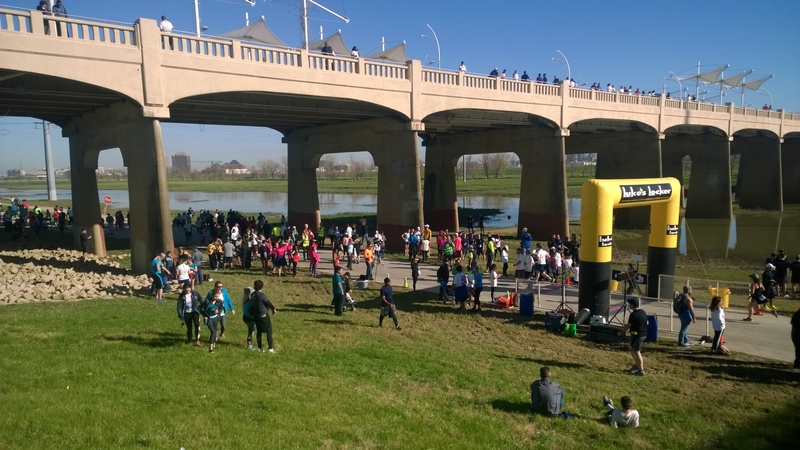 The forest begins near Moore Park Gateway in the shadows of downtown Dallas at the Santa Fe Trestle Trail​ and it continues south past IH-20. The Great Trinity Forest was actually created by the spring flooding of the nearby Trinity River. In the 1940s, as Dallas transitioned from farming to an urban landscape, the cotton and grain fields in the floodplain were abandoned and the river floods slowly began depositing seeds from upstream trees onto the fallow farm fields and in the abandoned neighborhoods. To ensure this forest will offer future generations of outdoor sportsman and nature enthusiasts' environmental abundance and recreational quality, the City of Dallas now has a 100-year Great Trinity Forest Management Plan, a sustainable study of the forest. The plan was approved in 2008 but the resources have not been allocated to fully implement its components. The document is an impressive 15,000 page document commissioned by the Trinity Watershed Management's Trinity River Corridor Project through the Department of Forestry at Stephen F. Austin State University in Nacogdoches, Texas. This comprehensive management plan addresses the wildlife habitat, recreational, and forest management needs of our unique urban hardwood forest. To examine the Executive Summary of the plan or to request a CD, write to mytrinityriver@dallascityhall.com. This forest is the last old growth bottomland hardwood forest in North Central Texas, and it is believed to be the largest urban bottomland hardwood forest in the nation. There are giant Bur Oak, Cedar Elm, Cottonwood, Pecan, Post Oak, Live Oak, and Bois d'arc trees, as well as picturesque ponds and meadows​. Once, the forest was home to large mammals such as deer, buffalo, and bear as well as small forest animals. Today, the forest shelters more than 100 native and migratory bird species and provides habitat for primarily small forest animals. The forest has another secret, the Texas Buckeye tree. A stand of important Texas Buckeye trees (White Buckeye) ​-- some of the largest of their kind -- are found in the forest. Buckeye trees only become large with age and when their habitat is left undisturbed, as it has been along the mud banks of the Trinity River. William Blair Jr. Park located at 3000 Municipal, Dallas, TX 75215 is a prime example of a large greenbelt for public enjoyment. The stately park has 900 acres and there is free public access to the entire park. The manicured portion of the park is furnished with a trailhead to take hikers behind the Rochester Levee system and into areas ripe with prairies, ponds and thick forest. The Bois d'arc Trail, a soft surface trail, was built into the dense tree canopy and it offers a beautiful four mile daytime hike. Named for the giant "Crab Apple" or Bois d'arc trees by a Boy Scout working on his Eagle Scout Project, this special place in Dallas is a cool break from the busy streets of the city. In late summer, giant emergent pickerel weed blooms in the back pond of William Blair, Jr. Park​​ attracting all sizes of butterfly species. Fostering Texas' wetlands, both natural and manmade, are among its most valuable resources. These lands provide many economic and ecological benefits, including flood control, improved water quality, harvestable products, and habitat for Texas' abundant fish, shellfish and wildlife resources. If future generations of Texans are to enjoy the same economic vitality and quality of life as past and present generations, effective strategies must continue to build additional wetlands in Dallas. Cages protect water lilies and pickerel weed, native emergent aquatic plants, from turtles and other dangers at the Lower Chain of Wetlands. The Lower Chain of Wetlands in the Great Trinity Forest (GTF) are functioning and impacting upstream floodwater levels by as much as one foot during heavy rain. 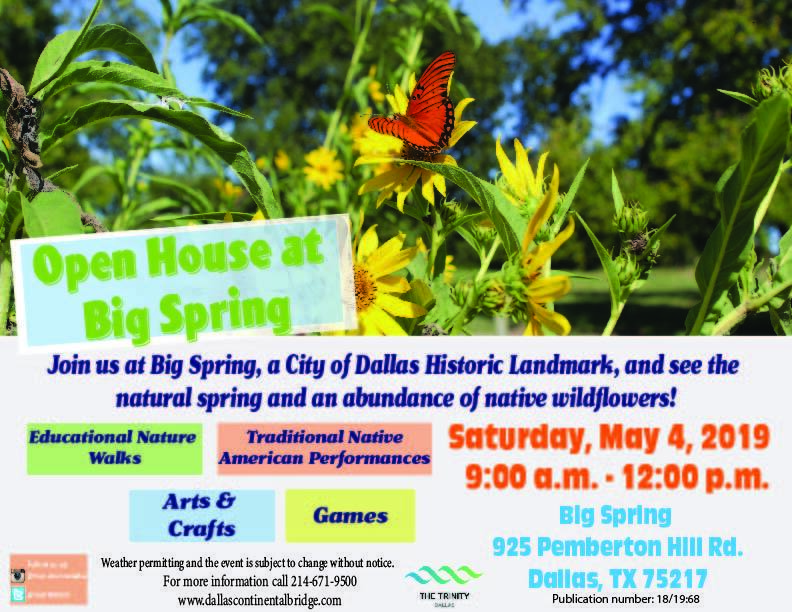 They serve the dual purpose of flood protection and habitat creation as well as providing a future economic stimulus for South Dallas in terms of recreation options. This system of wetlands will be joined with the Upper C​​hain of Wetlands to provide even more flood protection. The Upper Chain of Wetlands is located near MLK/Cedar Crest Bridge. Natural wetlands are attractive areas providing for long and short term water storage and the dissipation of floodwaters. The Dallas Floodway Extension (DFE) Chain of Wetlands provides new reservoirs for water storage and a secondary flowage path for flood waters along the west side of the Trinity River from Corinth to Loop 12. This secondary flowage path for floodwaters will come into use multiple times a year when the Trinity River leaves its banks. The result will be soil and nutrition from the river for wetland plants. The U. S. Army Corps of Engineers planted emergent vegetation around all existing cells. Trinity Watershed Management has a team of Environmental Specialists who maintain and oversee the wetlands along with various local, state and federal agencies. Instead of the normal flood water swale that holds water and allows it to gradually infiltrate the soil or be removed by evaporation or pumping, the U. S. Army Corps of Engineers planned the additional feature of creating these artificial, yet fully functional wetlands to hold water at all times. Each cell of the chain of wetlands is kept full of water year round by reusing purified waste water. A defined center channel and a control structure (sleuth gate) on each cell allows the City of Dallas to raise or lower the level of water mimicking the natural, seasonal variations in water levels as well as creating a gentle flow through the cell (a feature important for keeping the mosquito population in check). The wetlands are also tiered allowing the importation of various aquatic vegetation types. This voluntary conservation of the land and restoration of the quality of the environment around it through the Trinity River Corridor Project will serve many generations of Texans. The Trinity River Audubon Center is a success story of reclamation and sustainability. Originally, the land was an illegally operated landfill and the City of Dallas acquired the land through a court order. This closed landfill in southeastern Dallas is a visionary restoration project that reclaimed 120 acres of the Great Trinity River Corridor. The Deepwood Landfill site comprised 1.5 million tons of construction debris illegally dumped over a 15-year period. Following the criteria of the state's requirements and the goal of returning this land to nature for the use of future generations and as a site of the Trinity River Audubon Center, the devised plan consolidated the waste into capped rolling hills replanted with tall prairie grass and hardwood trees once dominant on the Texas Blackland Prairie. The City entered into a Voluntary closure Plan (VCP) to remediate the land and prepare it for reuse and to work closely with the relevant state and federal agencies to clean-up the site and reclaim the land. The City of Dallas decided to use the land to help restore the nearby neighborhoods and the forest by building a recreational and environmental component for the Balance Vision Plan. Subsequently, the idea for the Trinity River Audubon Center was developed. The Trinity River Audubon Center was designed by renowned architect Antoine Predock based out of New Mexico (http://www.predock.com/), an AIA Gold Medal winner in 2006. All of his structures are grounded in place and this is very evident when seeing the striking and dynamic architecture of the Trinity River Audubon Center. The beautiful 21,000 square foot building was designed to achieve LEED® Gold certification. The gold status became a reality in 2011 resulting in the first building with a gold status within the City of Dallas Parks and Recreation system.